May 11 By Jen 5 Comments This post may contain affiliate links. 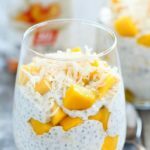 You will not believe how easy it is to make chia pudding, and this Peaches & Cream Protein Chia Pudding is so dang delicious! I’ve been trying hard to eat better because, well, swimsuit season is coming up. 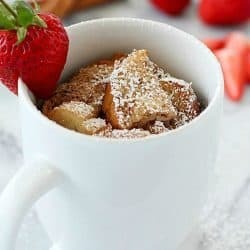 😉 Most of the time I eat pretty healthy but sometimes my sweet tooth kicks in after lunch or dinner and I find myself scrounging the cabinets for something sweet. If I’m being honest, I usually will overdo it and eat a bunch of treats. (Please tell me I’m normal?! Lol!) 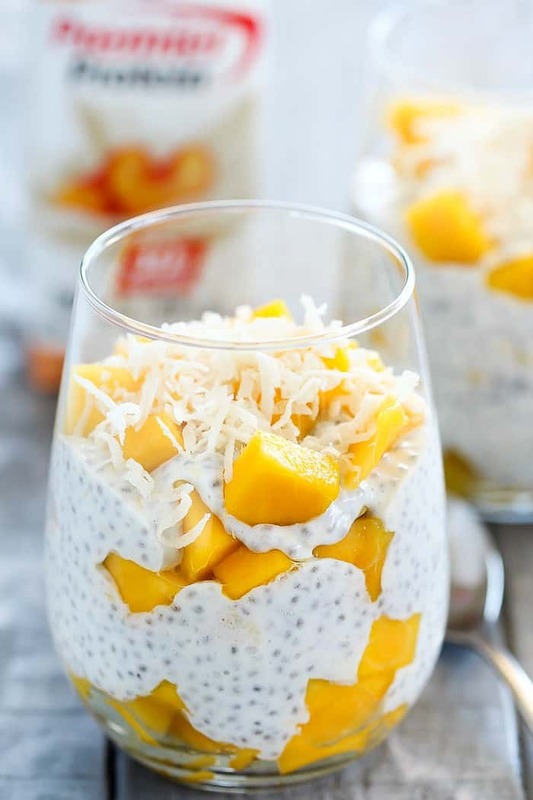 Instead of ruining a whole day of good choices by eating an entire candy bar, make this Peaches & Cream Protein Chia Pudding and have it in your fridge, ready to go!! 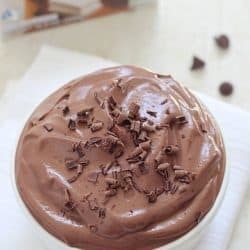 For real, this is as easy as it gets and with only 4 ingredients! One of the main ingredients is one of Premier Protein’s new shake flavors, Peaches & Cream! This new flavor is one of my very favorites now. 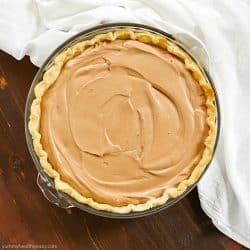 It’s creamy but not too sweet. It’s hard to believe you’re even drinking protein because it tastes more like a dessert. No chalky protein taste. Each shake is packed with 30g protein and contains 160 calories and only 1g of sugar! I’m really excited to be partnering with Premier Protein for the next few months and creating recipes using their amazing products. These shakes are incredible. 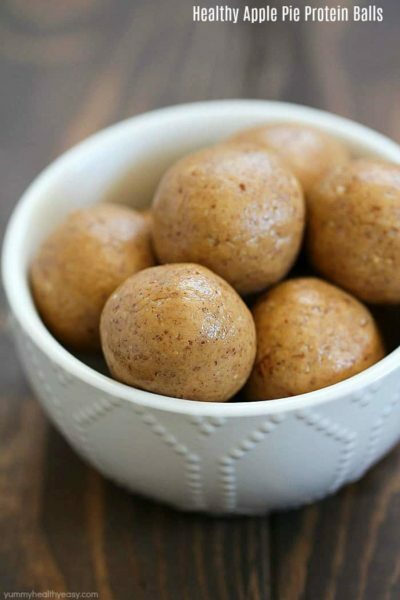 They are packed with protein to give you the energy you need every day. They’re ideal for breakfast on the go, an afternoon snack, a healthy meal replacement or a post workout boost. If you haven’t tried them yet, get on it! For more information, including where to purchase, visit Premier Protein’s website and @PremierProtein on Facebook, Twitter and Instagram. 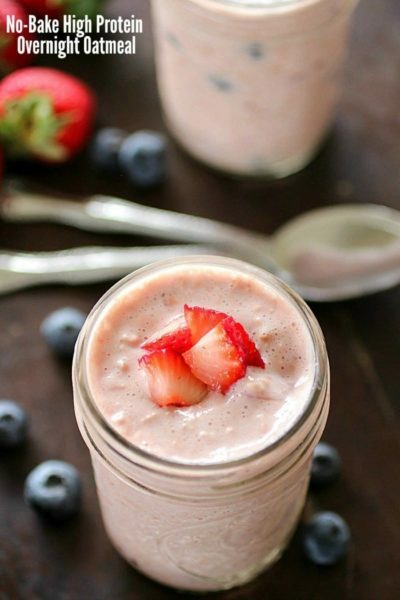 All you have to do for this recipe is combine Premier Protein Peaches & Cream shake and chia seeds in a jar and shake it up and let sit in the fridge for a few hours. Then you mix in non-fat peach Greek Yogurt. 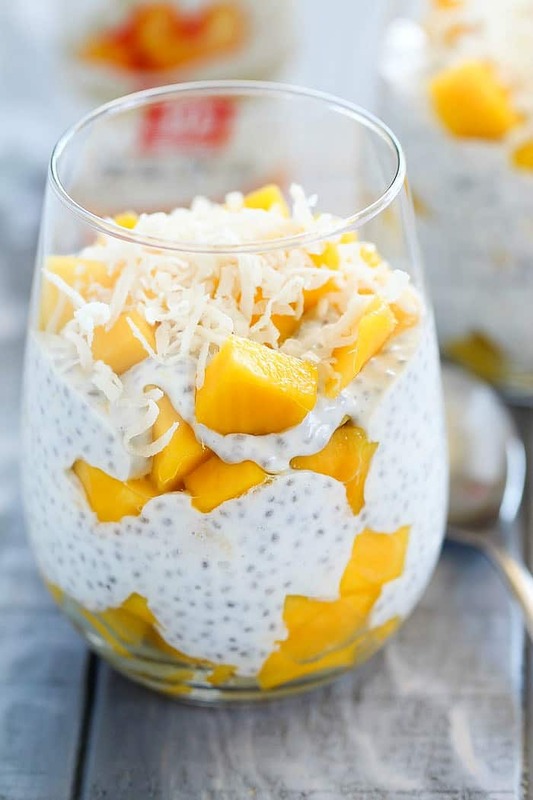 I like to layer mine in a glass cup with diced peaches and mangoes, or pretty much any fruit you like and then top with some coconut. 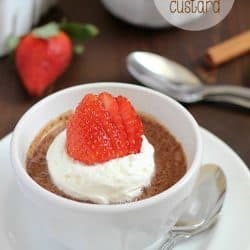 I’m a huge fan of chia pudding. 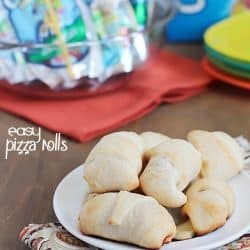 It has such amazing texture and flavor and adding in peach flavor is a winning combo! 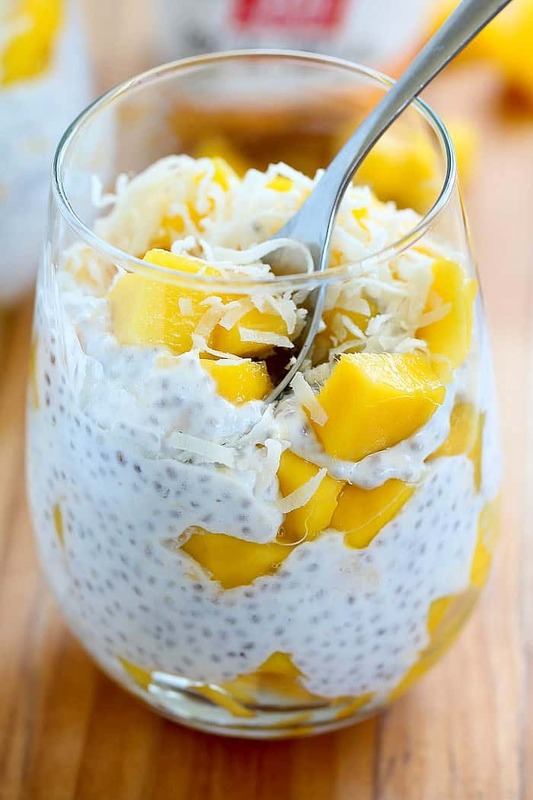 This Peaches & Cream Protein Chia Pudding satisfies your sweet tooth, fills you up without needing to eat very much of it (because of the protein) and tastes incredible! I hope you’ll give it a try! Be sure to check out all the flavors of Premier Protein’s shakes including the two newest ones, Peaches & Cream and Cookies & Cream. Stir the chia seeds into protein and refrigerate for at least 1 hour. Fold in yogurt to the chia seed mixture. 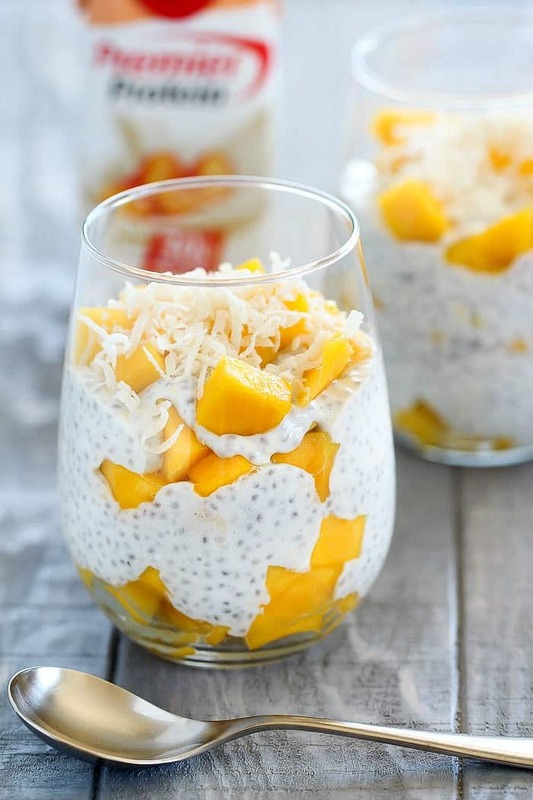 Layer peaches and then Chia Pudding mixture. 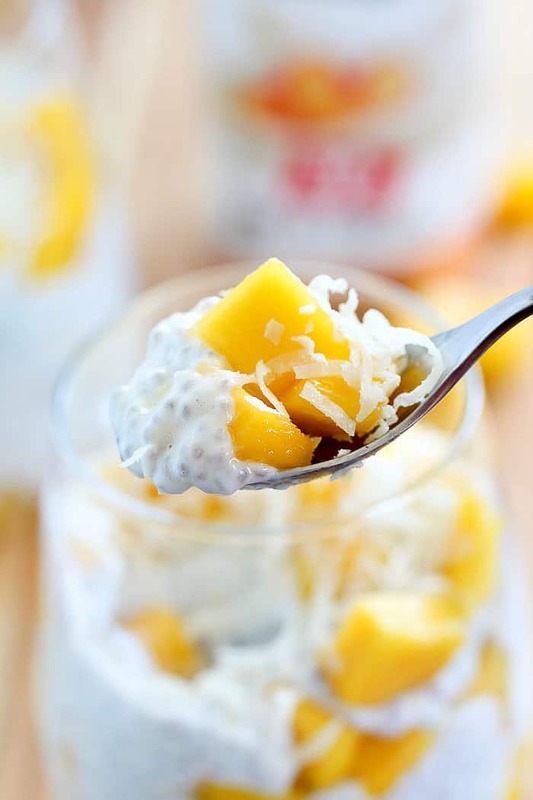 Top with coconut, if desired. Enjoy! Thanks to Premier Protein for sponsoring this post! This is a great idea for a midday snack! 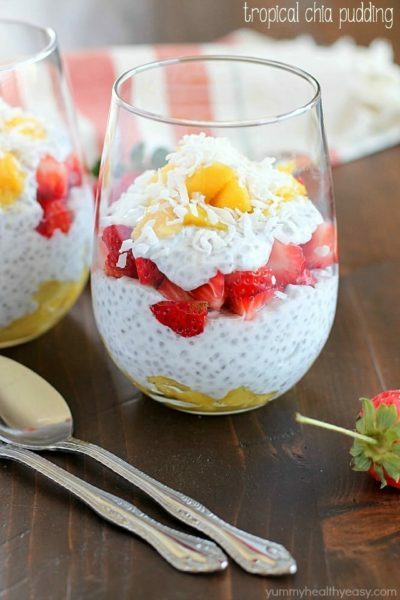 I love desserts or snack that involve chia seeds! 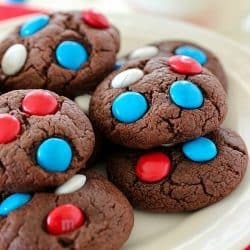 I don’t have protein mix what can I use in place of this? Hi Jodi! You can replace the Premier Protein Peaches & Cream drink with coconut milk or any other variety of milk. Note that the protein count will be lower, though. I hope that helps! Thanks! wow, it’s delicious, thank you for sharing the way.